Once you start a new section or introduce a new chapter in your course, ask students to write about one thing for a few minutes. It can be a question they have about the day’s reading material or a short summary of the major points made during the lesson. You can later use those materials as your opener for a day – answering popular questions is a great method for clearing up any doubts about the material. These writing pieces work best when written anonymously. This is a really smart idea. Ask your students to write a short note meant to summarize their recommendations to other people in the class concerning some particulars of the taught subject. Ask them to be persuasive and offer arguments that make sense – this is a great exercise for arguing and providing relevant evidence. Have your students keep a regular journal to record interesting examples and puzzling ideas as they study – during lectures, seminars or while reading. The entries can include passages copied from various sources, as well as original ideas sparked by discussion in class. It’s not a bad idea to collect the journals once or twice a semester – you’ll need to keep them motivated and make them understand that these can later help them in preparing projects, papers and reviews. Don’t grade those entries, but assign a pass or check mark to them. 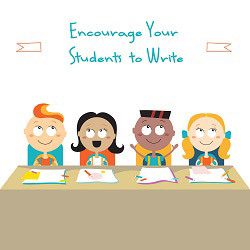 Be ready to spice things up at your classroom with writing. Instead of simply asking students to provide the right formulas or answers, make them actually describe their thinking process when solving a certain problem. This will allow you to see whether they have a full understanding of the subject. This is a great idea for making journal writing a bit more exciting. Ask your students to draw a line down the middle of every page. On the left side, they can record data, such as a line from their textbook or a practical explanation. The right side of the page will be used for recording their responses to all the information included in the left-hand column. This exercise will help your students develop a different perspective on those pieces of data – they’ll assess them and then make judgments about the information. Ask students to reread their responses from time to time – this will help them draw conclusions about their initial attitudes. Getting the hang of the most important points of a reading and then stating them in a clear and succinct fashion are skills students should simply practice. It’s a good idea to develop a standard format for those writings – like index cards – to make collecting and reviewing them easier. Make sure your students know that summarizing a piece of writing is never about being correct or incorrect. Have them do this exercise three or four times a semester and you’ll soon notice how they fall into habit of reporting thoughts or ideas in a precise manner. Writing is a skill essential to every aspect of our lives. Being able to express themselves clearly and form logical arguments that are both informative and persuasive is of great value to your students’ personal and professional development.